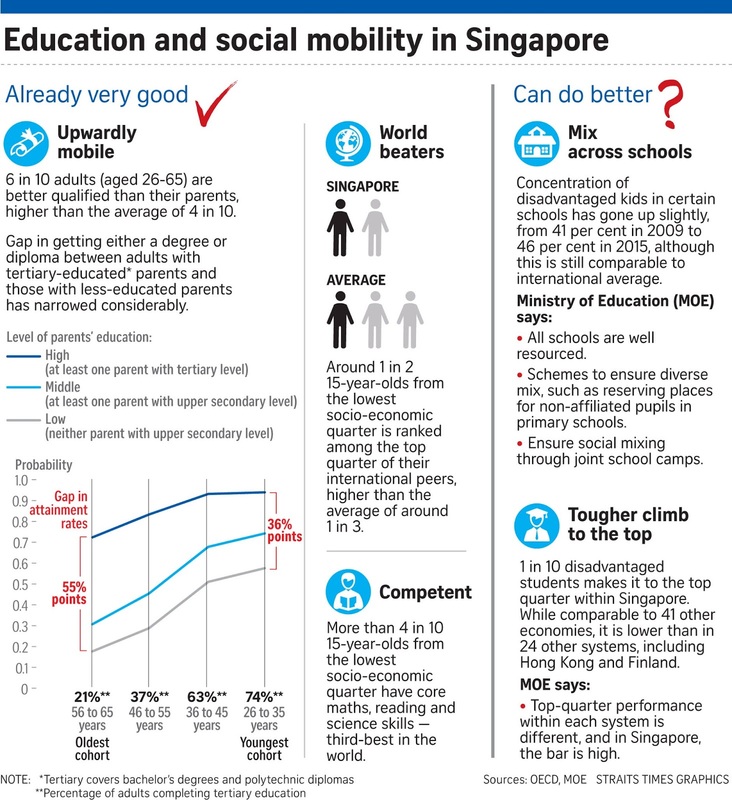 Singapore ranks among the top in the world when it comes to upward mobility in education, with nearly six in 10 adults attaining higher qualifications than their parents. According to a report by the Organisation for Economic Cooperation and Development (OECD) released yesterday, across all age groups, those with more qualified parents are likely to end up better educated than their peers. But the gap in Singapore has shrunk considerably over the years. In the 1950s, someone born to parents with only upper secondary education stood a less than 20 per cent chance of completing tertiary education. Now, such a person has about a 60 per cent chance of making the grade. For those born to at least one parent with tertiary education, the figure has grown from over 70 per cent to more than 90 per cent. The OECD report also pointed out how disadvantaged students here whose parents are less educated do well compared with their peers around the world. About half of 15-year-olds from Singapore from the bottom quarter here scored among the top quarter of students globally. Many of them also have core skills in science, reading and mathematics, according to Programme for International Student Assessment results. However, the study also showed that only one in 10 in this group is able to keep up with the best of his local peers in the top quarter of performance. Many disadvantaged students in Singapore also tended to be clustered in the same schools. 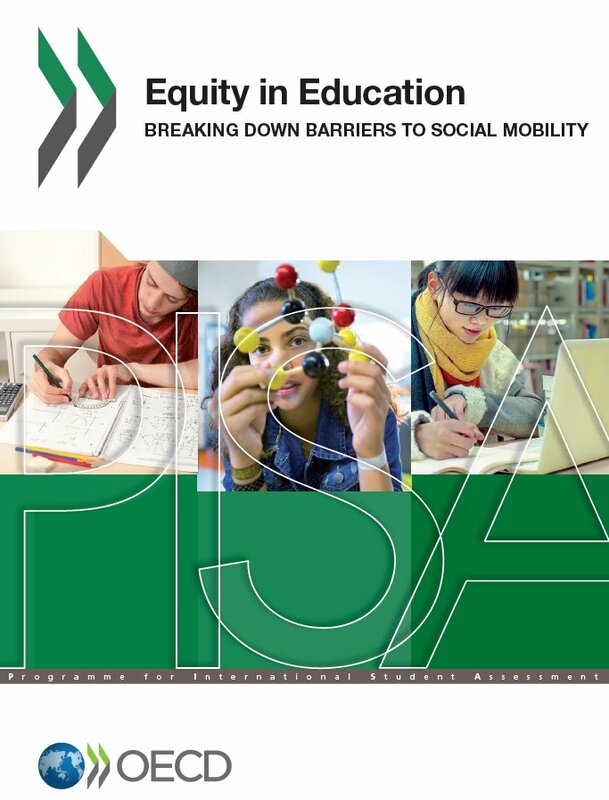 In its report on equity in education, OECD highlighted how disadvantaged students around the world face a variety of barriers to learning, from a lack of resources such as books and games, to access to early education. But Singapore stood out because of "the enormous strides made by adults with low-educated parents", it said. "Even disadvantaged adults in the two youngest cohorts were more likely than not to complete tertiary education - among those with low-educated parents, the probability of completing tertiary education was 51 per cent for adults aged 36 to 45, and 58 per cent for adults aged 26 to 35." The Ministry of Education (MOE) said yesterday that it is heartened to see that education mobility across generations has improved over the years, as it opened up pathways to technical and vocational education, and ensured that every school and institution is well-resourced. It also said that students from less affluent families here fare well compared with their peers in other countries and in absolute terms. But it acknowledged the report showed that more work needs to be done to ensure good social diversity and mixing in schools. The ministry emphasised that all schools are well-resourced and much has been invested in providing high-quality education to disadvantaged students. For example, it has set up specialised schools for Normal (Technical) students or those who do not pass the Primary School Leaving Examination. MOE also said that efforts to level up students who need more support through literacy and numeracy programmes have also paid off, as students from socio-economically poorer homes have done very well by international standards. It noted that going forward, it is more important for people to develop skills instead of pursuing academic qualifications alone. The OECD study had found that with more tertiary-educated adults, the proportion of Singaporeans outdoing their parents has started to fall. Fewer of those aged 26 to 35 attained a higher level of education than their parents, compared with those in the 36 to 45 group. The OECD findings are based on data from 72 countries and economies which took part in previous PISA tests, and a survey of adult skills. Our new PISA report is now available! Disadvantaged students in Singapore fare well by international standards, but when it comes to within the country, they find it harder to match up to the top performers. A report by the Organisation for Economic Cooperation and Development (OECD) released yesterday found that Singapore ranks third in the world - behind Macau and Hong Kong - in terms of its share of students in the lowest socio-economic quarter who score well in science, maths and reading. Some 43 per cent of 15-year-olds here from disadvantaged families showed that they had a good grasp of these core skills, compared with the OECD average of 25 per cent. The 2015 Programme for International Student Assessment (PISA) test had also found that about half of Singapore's disadvantaged students emerged among the international top quarter after accounting for socio-economic status, higher than the OECD average of about 30 per cent. But when it comes to "national resilience", which looks at how these students fared against the top science performers in their own countries, only one in 10 of Singapore's disadvantaged students met the mark. This is lower than the proportion in 24 other education systems like Hong Kong and Finland. The Ministry of Education (MOE) said that the OECD report shows disadvantaged students here do very well in absolute terms and relative to their peers from other countries. But the bar they have to cross to be considered "nationally resilient" is much higher as top students here perform very well, it said. For instance, only 10 per cent of students from lower-income families in Singapore obtained a score of at least 631 in the 2015 PISA test for science. A score of 631 is considered the 75th percentile mark for science for Singapore students. But in Finland, the bar was lower as its 75th percentile score was 599. As a result, 14 per cent of its lower-income students could hit this score or higher. In comparison, about 17 per cent of "disadvantaged students" in Singapore would reach a score of 599 and above. Observers said that parental involvement plays a key role in contributing to the differences in students' performance. Ms Denise Phua, who chairs the Government Parliamentary Committee for Education, said that while MOE has pumped in more resources for disadvantaged students and tried to improve social diversity in popular schools, the gap in achievement remains as "the aspiration and desire to be ahead of the race is relentless". "As more parents move up the income ladder and perceive performing well in schools as a route to top schools and good jobs, the race to compete for popular schools gets more intense," she added. Associate Professor Jason Tan of the National Institute of Education said: "It is a global phenomenon that when governments try to increase tertiary enrolment to satisfy demand, well-off parents strive even harder to ensure their children remain competitive in the system. It is then more difficult for children whose parents don't have the financial means or social networks to do as well." Nearly half of low-income students in Singapore are concentrated in the same schools, a report by the Organisation for Economic Cooperation and Development (OECD) has highlighted. The report, released yesterday, found that 46 per cent of disadvantaged students in Singapore were attending "disadvantaged schools" in 2015, up from 41 per cent in 2009. The OECD average is 48 per cent. Disadvantaged students are those in the bottom quarter of the socio-economic index within their country, while disadvantaged schools are defined as those which take in the bottom quarter of the country's student population. 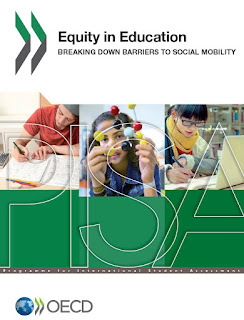 The report, titled Equity In Education: Breaking Down Barriers To Social Mobility, said poorer students in such schools face a double disadvantage, as these schools may not have the best of resources, whether in teacher quality or financial resources. It recommended spreading out the share of low-income students across schools and improving social diversity in schools by reshaping school admission policies. In response, Miss Cindy Khoo, divisional director of the Education Ministry's (MOE) planning division, said yesterday that the ministry has been monitoring the socio-economic profile of students in schools, independent of the OECD finding. It is concerned about the "slow creeping up of the proportion" of low-income students in "disadvantaged schools", she said, although the term "disadvantaged schools" can be misleading. It implies the learning needs of disadvantaged students are not catered for in these schools, she said. "But in Singapore's context, all our schools are well-resourced by international standards." She added that students of a lower socio-economic status in what OECD termed as "disadvantaged schools" are actually not worse off in terms of facilities. MOE has been providing more support through literacy and numeracy levelling-up programmes, and increasing financial support for needy students. It also reviews admissions processes to ensure schools do not become closed circles, and students can interact with people from different backgrounds, said Miss Khoo. For instance, since 2014, 40 places in every primary school have been reserved for children without any prior links to the school. From next year, one-fifth of spots in secondary schools affiliated to primary schools will be set aside for those who do not benefit from affiliation priority. While the ongoing debate over social inequality has led to some valid criticism of meritocracy, it is still the best model for Singapore, said Education Minister Ong Ye Kung. But the system has to evolve, he said, to tackle new challenges and move away from a narrow focus on past academic merit to recognise and celebrate a broader range of skills, talents and strengths. "It should translate into tangible changes in the way we hire people, admit students to tertiary institutions, grant awards and scholarships, and accord respect to fellow Singaporeans," said Mr Ong. He was speaking yesterday at an event by charity Equal-Ark a day after the Organisation for Economic Cooperation and Development released a report on equity. The report found Singapore to be one of the most successful countries when it comes to uplifting successive generations through education. But it noted that disadvantaged students seemed to be concentrated in certain schools, and that they found it tough to match their local well-to-do peers, despite outdoing students on the global stage. Addressing the report, Mr Ong said that meritocracy has helped hundreds of thousands beat the odds - 15 years ago, half of students from the bottom 20 per cent on the socio-economic scale went on to post-secondary education. Today, nine in 10 do. Over the same period, the proportion of those from this group who went on to get a publicly funded degree or diploma has risen from 40 per cent to 50 per cent. But "what used to work for us is starting to work against us", Mr Ong said. "As families do well, they spare no effort in investing in the abilities of their children, especially when they believe in meritocracy. As a result, children from different family backgrounds are pushing off blocks from different starting lines." Another headwind concerns how the proportion of students from lower-income families is shrinking. "Ten years ago, about 20 per cent of our employed households had an income of $3,000 or less... Today, this has gone down to well below 15 per cent. But that also means that the smaller group of families that continue to remain poor are facing more difficult challenges." Mr Ong stressed the need to recognise this fundamental point - that these challenges have arisen not from meritocracy's failure, but from its success. "So, let us not discard meritocracy, for I don't think it has finished running its useful course." Meritocracy instead needs to adjust, he said, and the approach is to "not cap the top, but do even better in lifting the disadvantaged". The Education Ministry (MOE) already provides more resources to weaker students. Those in the specialised schools such as NorthLight and Spectra receive around $24,000 in resourcing each. About $20,000 is spent on each Normal (Technical) stream student, and around $15,000 or less on the rest, Mr Ong said. Around 6,000 more students from lower-income households are able to tap financial assistance schemes after the income criteria was relaxed in April. And MOE has been investing heavily in kindergartens to help lower-income families access quality early education, he added. Acknowledging that the concentrations of disadvantaged and privileged students have intensified in certain schools, Mr Ong said more can be done to counter this "unhealthy trend". One way is to have a better mix of students in every school, he went on, pointing out that from next year's Secondary 1 posting exercise, a fifth of school places will be reserved for students without affiliation.